Hello. Today's podcast is our 6th idea for how to celebrate Lincoln's upcoming 200th birthday on February 12, 2009. When one examines the life of Lincoln is difficult to not respect the number of difficult decisions he had to make for the good of the nation. 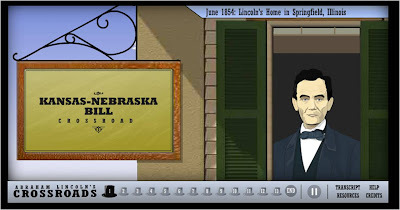 Lincoln's Crossroads Game from the National Constitution Center is an interactive way for your students to learn about the issues of Lincoln's time and then make their own choice. You will compare your decision making skills with Lincoln on 13 issues and learn how many times you made the same choice. Check out the podcast and get a quick preview with the screencast embedded below. Thanks for pointing me to this resource. I was at the Constitution Center about two weeks ago, and it's a phenomenal place - I'm still exploring their website. I don't know that I'd call this a game as much as a "slightly interactive" story. But still, I find it to be of value and will share it with others. Thanks Bud. The museum is awesome. I had the opportunity to spend about 5 days there during the summer of 2006 as part of a teacher workshop. I probably should have used the word "animated" instead of "interactive" to describe the game. Nah - interactive's fine, animated's good, I guess I wouldn't call it a "game." But I'm not knocking it - thanks for pointing me back to the website! Five days. Wow. What an experience, I bet.